A Fife entrepreneur has scooped a top business award for the growth of his Kirkcaldy-based content marketing company. Chris Marr, who hails from Leven, landed the High Growth Business of the Year 2015 accolade at the WeDO Scotland Awards in Edinburgh after doubling the turnover of his business, the Content Marketing Academy (CMA), in the last 12 months. Chris, who launched the CMA in 2013, also doubled his team and moved into new office premises at Fife Group’s Mitchelston Industrial Estate complex earlier this year. He said: “I started out in business for the first time back in June 2013 and, since then, have never benchmarked the performance of the business. 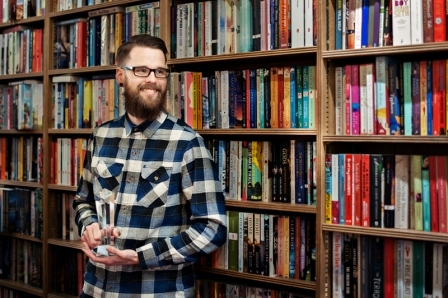 Marketing graduate Chris applied for the award at WeDO Scotland – an Edinburgh-based networking group of which he is a member – but, after a rigorous, three-step application process, was doubtful he would win. After submitting his initial application, followed by a video, Chris was surprised to learn he’d made the final. He then beat off stiff competition from fellow entrepreneur Anthony Gerrard, Chief Executive of Glasgow-based Bad Idea, in a face-to-face interview with the WeDo judges. He said: “It’s a real honour to be recognised for a lot of hard work over the past two years or so. “It’s also great to be able to show my friends and family that all the hard work has paid off. Chris was presented with his award by WeDO Scotland Awards sponsor and last year’s winner Martin Walker at a special ceremony at the Sheraton Grand Hotel in Edinburgh. He’s now looking forward to expanding the team further, moving into even larger premises in due course and to hosting his third Content Marketing Academy conference in 2016. For more information on Learning Everyday, click here.